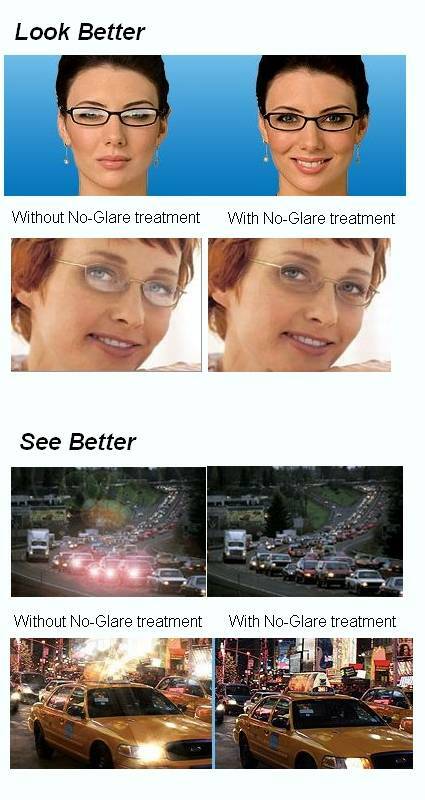 Anti-reflective coating (also called AR coating or anti-glare coating) improves both your vision through your lenses and the appearance of your eyeglasses. Both benefits are due to the ability of AR coating to eliminate reflections of light from the front and back surface of eyeglass lenses. With fewer reflections, more light passes through the lens to the eye for good vision and the lenses look more transparent and attractive. Anti-reflective coating also is a good idea for sunglasses, because it eliminates glare from sunlight reflecting into your eyes from the back surface of tinted lenses when the sun is behind you. Lenses without anti-reflective technology develop visible light reflections that can be dangerous when driving on wet roads or at night. The anti-reflective technology in our anti-reflective coatings help reduce reflections to less than 1% of the light — compared with 7% to 13% for uncoated lenses. Plastic lenses help make glasses lighter and more comfortable, but they’re much more prone to scratches than glass lenses. The high-quality, scratch-resistant technology in our anti-reflective coatings help keep lenses from getting scratched. Dirt and dust can cling to traditional untreated lenses, blurring your vision. But the patented anti-static element helps repel contaminants like dust and debris. Grease or droplets of water can slide off the surface of lenses treated with this super-slick coating, so the lenses are quicker and easier to clean. Anti-reflective coatings provide superior super-hydrophobic performance that keeps the lenses clean longer.